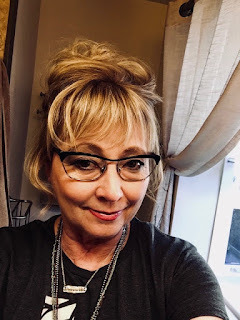 We have a very interesting feature for you today, my friends, as we are zipping to Arizona, to chat with one of our newer members, Linda Lee Lyberg, who blogs at Charmed Chaos. Linda is also sharing some wonderful photos of her gorgeous garden with us. Pour yourself a cup of tea, and pull your chairs in close. Prepare to be amazed. Sherry: Linda, I am so happy to be chatting with you. Give us a snapshot of the poet at home, won’t you? Tell us where you live, with whom you share your life, and don’t forget any fur critters! Linda: The pleasure is all mine Sherry. I am so honored to be a part of this thriving community of writers. For the last 21 years, my husband, Pete (AKA my Big Viking) and I have made Mesa, Arizona our home. The summers are brutal, but when everyone else is shoveling snow, we are enjoying the sunshine and cooler weather. I love nature, and all throughout the year I see a variety outside the window of my writing room. In the summertime, it is not unusual for us to have an entire flock of peach-faced lovebirds around our feeders. They are not native to Arizona. Local legend has it they escaped from an aviary and thrived here because the climate is like Africa’s, where they are from. Sherry: I would love to have visits from such exotic birds! How wonderful. Linda: We live with a 13 year old chihuahua terrier mix named Ricky Bobby McGee, affectionately known as “Bubba”, a rescue my daughter found in Houston, Texas. I had her put him on a plane and send him to me. This little guy has quite a story on his own, and one I wrote about early on in my short story, “The Heart Thief.” He is my constant companion since I no longer work. Sherry: The heart thief indeed. What a wonderful story. As it turned out, he was there to help you through the loss of your elderly dogs, and beyond. What a sweetheart he is. Linda: Wow. Well, there is always a lot more to stories than we tell. I was born in Houston, Texas on Oct.1st in Hermann Hospital. When I was little, my dad would tease me and say that I was not born in Hermann hospital, but rather at the Hermann Park Zoo, which was across the street from the hospital. My dad was famous for cracking jokes. What I know about his side of the family comes from different sources. You see, my mom and dad divorced when I was two and from that point on, his presence in my life was sporadic. There was a time I resented him for not being more of a father, but I came to forgive him and love him for who he was. He was an artist and dreamer, and an intelligent guy. But he had the soul of a gypsy, always wandering. My grandmother was a blues singer, and what I know of her story is sketchy. There was a time she left my grandfather for a mobster in Florida, but returned home when my grandfather became ill.
Sherry: You have the makings of an amazing memoir here! Linda: My grandfather was the contortionist; he could put his head between his legs and get his wallet out of his back pocket with his teeth. I have an old photo which I am sharing here. In the photo, he wears clown makeup. Grandpa is posing on a chair, bent almost in half. Sherry: Oh my goodness, this is our first contortionist at Poets United. Every single poet I interview always has the most AMAZING story. I am totally hooked; this is why I love my job so much. Linda: Old acquaintances told me he performed before the King of England at one time. He would put a chair on top of 4 heavy glass vases (one for each leg) and do his act. I am the owner of the only surviving vase. My one and only memory of him is not pleasant. I was visiting them, and my grandmother went outside to hang clothes. I was a tiny stick of a girl, and my grandfather came into the kitchen, took out a knife, and cornered me. I remember the feel of the sharp cold kitchen cabine handles against my back. Because I was skinny and agile, I slipped between his legs and ran out the back door. In hindsight, he must have had dementia. Linda: In essence, I grew up surrounded by my mother and her family. My mother did remarry, but that in and of itself is yet another story. We grew up poor, but I never went hungry in my mother’s house. It was only when I visited my father that food was scarce. I do believe my childhood and my early adulthood prepared me for writing. I have faced some heart wrenching challenges throughout my life. It’s built character, strength, and resilience. Sherry: Yes, it does build character - it is an amazing journey. When did you begin writing, Linda? Was it poetry or prose at first? And when did you write your first poem? Linda: I began writing in my early twenties, keeping journals. There were a lot of hit and miss entries when I look back on them. I would go months not writing anything and then get a renewed passion and begin again. Those were turbulent years of my life. I always felt I was different from others. I wrote my first poem on November 5, 1985. It is on my blog and the title is "Images". I have included it here. What we are searching for. Sherry: A wonderfully depth-full first poem. What do you love about poetry? Linda: What I love the most about poetry is that when I write, I lose myself. Nothing else matters, but the words I am putting on paper at that moment. I am completely present and immersed in my writing. I write with a 9MM lead pencil and blank white paper- no lines, no tablets, no notebooks but for taking brief notes. Sherry: And he was right. What are your thoughts on form versus free verse? Which do you prefer and why? Linda: I like both. There are times when a poem I am working on screams for stream of consciousness writing, which to me, is free verse. It is at those moments when I let the words spill as they come, then worry about breaks, etc afterwards. When I started my blog, I had no idea there were so many forms of poetry! An entire world opened up for me to explore, and I continue to do so. I love the challenge of attempting a new form, and while I may never master it, I will put effort into the finished piece. When I do write form poetry, one of my favorite forms is the Pantoum, which is tricky. I am left handed, and as such I sometimes struggle with sequences and patterns. One of the tools that helps me with writing a Pantoum is a blank template I found online that I print out and use to this day. Here is the link if anyone is interested. Sherry: I love those words, "soaring as free as vibrant birds". And I resonate so much with “I write to feed a hopeful heart.” Me, too. Do you have two other poems you would like to share with us? And tell us a bit about each? Your shining charisma I cannot fight. Your intent, made perfectly clear. I know I’ve crossed over the line. Once imagined, are now my blisses. In this poem, I am starting to explore passion, desire, and sexuality. I enjoy writing about these emotions; I have been told I do it well. Sherry: You do, indeed. I have learned you are an artist as well as a poet, Linda. Tell us about your art – when you began painting, the medium you prefer. Is there difference or similarity in the way you feel when you complete a painting or finish writing a poem? Linda: I started drawing when I was a young girl, pencil drawings. My dad taught me how to draw a tree, a log cabin, a scene in the woods. He passed on his love of nature to me. In 1975, my mother gave me a set of oils, brushes, and canvasses for Christmas. I took a couple of painting classes and enjoyed it. I’ll never forget one landscape I painted of a bear in a stream catching salmon. It was so rough and in the end the bear looked like it was laughing! Over the years, I have taken various art classes- pottery, acrylics, pastels. And all the while I was holding down various jobs. But it is hard for me to do both- my brain functions in a different manner. I am not one of those people who switches gears and is able to jump from crunching numbers or leading people to writing poetry. Now, in my later years, I do what I can to honor that creative space and help it thrive. In the early 2000’s, I began designing birdhouses and my husband, a skilled carpenter, built them. I used them as a canvas for my art. At one point, we put them for sale in a gallery in Sedona, AZ and a gallery in Tubac, AZ. In November 2002, they were in Phoenix Home & Garden magazine in an article about local artists. Working and everyday life soon took precedence and my art took a backseat. Sherry: I love your birdhouses! They are so cool! Linda: What I discovered during my forays into various forms of art is I am able to do them and succeed. And while I enjoy them from time to time, my greatest passion and joy comes from writing. Sherry: And we benefit from reading your poems, so we are happy that you write! When did you come to the blogging world, and how has it impacted your work? “The art of leadership, as Max says, is “liberating people to do what is required of them in the most effective and humane way possible.” Thus, the leader is the “servant” of his followers in that he removes the obstacles that prevent them from doing their jobs.”- The Art of Leadership. So in essence, I was using my creative abilities, but in a much different manner. After over 35+ years, I was mentally drained and exhausted; I needed a change. Those first few weeks, I rested, but I knew I wanted to do something. I prayed and meditated a lot, seeking guidance. A friend shared with me stories from a writer who used Wordpress for their platform. I didn’t tell anyone (not even my husband), but I made a decision I was going to write, put my words out into the world, and see what happened. A few months later, I entered a writing challenge on a blog, and much to my amazement, I won first place for my short story. The day I found out I cried- it was June 2, 2017 and I had been writing almost everyday for 4 months. My first published story came as a result of a writer’s group I belong to on Facebook. I entered a contest, but this time I did not win. My story caught the attention of one of the judges, and she asked if she could use it in an anthology. Of course I said yes, and of course I cried. In June of this year, a publishing company came across my blog and asked if I wanted to submit some of my work. I submitted, and as a result, one of my stories is in Arizona’s Emerging Writers: An Anthology. When I recently received the book in the mail, held it in my hands, and saw my name on the Table of Contents page, I was so moved. Unless you are a writer, I don’t think people understand what that does to you. I am watching a series on PBS and just last night a line was said that stuck in my head: “Fireworks only go off in the author’s head.” What an apt description! Sherry : Yes, there is nothing as satisfying as holding a book in one's hands, knowing our words are preserved for posterity. Well done, Linda! What other activities do you enjoy, when you aren’t writing or painting? Linda: As I said earlier, I have a love of nature. I enjoy gardening, even here in the desert. I grow herbs, vegetables, roses, desert milkweed for the butterflies, and other flowers. It’s an amazing garden and I have shared photos from time to time on my blog. Sherry: What a BEAUTIFUL garden! Wow! Linda: Two years ago, my garden was deemed a Monarch way station from MonarchWatch.org. so I grow plants that will help sustain them. I also love to cook and try new recipes. A few years ago, I took cooking classes that were being offered at Le Cordon Bleu, a cooking school in Scottsdale. I learned so much about technique and enjoyed the classes. I love animals and I spend all day with my little dog. He sleeps on the chair behind my writing desk. My husband says if I had my way and the HOA didn’t have any rules, I would have every stray animal living with us, and he’s right. And of course, as a writer, I read, read, read. I may soon have to get another bookshelf just for books I haven’t yet read, but want to! Sherry: Your life sounds wonderfully rich and full. Your garden is sensational. I love that it is a Monarch way station! Is there anything you’d like to say to Poets United? Linda: Although I have been blogging and writing for such a short time, I have learned so much from this community. I enjoy the interaction with other writers, and Poets United has been a wealth of information for me, and a platform to get feedback on my poetry. Sherry: You are most welcome, and thank you, Linda, for this lovely visit. It is so nice to get to know you better. We look forward to reading your work in the months ahead. Isn't it wonderful, learning more about our fellow poets, my friends? Do come back and see who we talk to next. Who knows? It might be you! I like Linda's work, so it was nice learning a bit more. LOVE ❤️ The birdhouses. What a fascinating interview, Sherry and Linda. I have been reading Linda’s work for some time now and have really enjoyed finding out about her life. The Contortionist was an interesting character, and I want to know more about the blues singing grandmother who ran off with a mobster! I don’t know much about Arizona and love it when Linda writes about the desert, and I’m amazed at the beauty of her garden, the huge variety of plants, and the birds that visit and use the beautiful birdhouses. As Linda knows, I’m also a nature lover, with a garden full of wildlife – but so different! 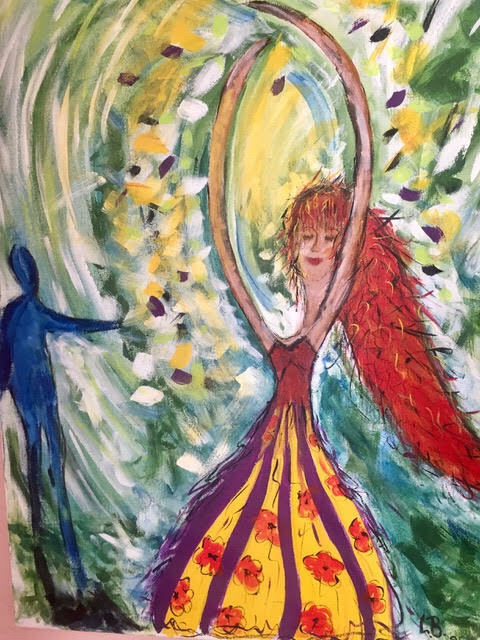 Thank you, Linda, for sharing your first poem and your artwork. My Pleasure Kim> Ic insider you one of my mentors as you always give such insightful feedback. I love the birdhouses too! They are so wonderful! Thanks, Linda, for helping us get to know you better.......we look forward to enjoying much more of your work. Thank you Sherry! I am going to put a link to this on my blog so others may read if they so choose to! Please do! Your followers will enjoy it! I so happy for you. I have learned so much more about you by reading this, and it shows through beauty of you writing. Congratulations!!!! Hi Linda...I enjoyed learning all of the details of your poetry writing and other artistic endeavors. "Writing in Prisms" is my favorite of the poems that you shared. You are indeed a talented artist. I feel the same way as you do about animals..if I could have more dogs, I would. How exciting for your garden to be a Monarch way station! I would love having monarchs flit in and out of my yard. I look forward to reading more of your poetry (and hope you will also visit my blog sometime as well - smiles). Thank you, Sherry, for another very interesting interview. You have a way of seeking out poets and presenting the most interesting information about them. I always really look forward to your Monday features! I am so hooked on peoples' stories, and how unique and interesting each one is. I never get tird of it. It is like opening a new book, every week. Smiles. Mary- thank you so much for your kind thoughts. I will certainly check out your blog! So nice to read Linda's poetry and learn about her life and talent as an artist. The birdhouses are adorable, Buddha is precious, Linda's paintings demonstrate her creativity and her garden is beautiful. How wonderful to have such a diverse collection of artisitic successes! Thank you Linda for sharing your story. Sherry, as always - a fascinating article. Thank you so much Myrna! Peach-faced lovebirds and "fractal prisms"--home for one in your birdhouses and for the other in your poems! I am very impressed, Linda Lee. Everything you touch--even leadership--is art. Thank you both for a splendid feature! Thanks Linda for taking us into your fascinating world of words and colors. Love the poems shared here, specially "Writing In Prisms". Thank you Sherry for the wonderful post. Thank you for the kind words Sumana. I'm happy you enjoyed it, my friends. We have such talented folks in our community, it makes my job easy! Smiles. Here I am - late to comment, once again ... but what a lovely share. I so relate to Linda's remarks about how difficult it is to work full-time and be creative. I too, found that shifting gears from work related activities to art and literature, was almost impossible, all the years that I worked - and am so grateful for this 'gift of time' to pursue my writing (so much more satisfying that balancing books). Your poetry is beautiful, Linda. In particular, I thought that 'Writing in Prisms' was stunning. Thanks once again for making these visits happen, Sherry, and contributing so much to our Poetry Community. Great job on this, Poets! Wendy, I feel the same about "the gift of time" this time of our stage of life offers, after such a long working life. I am so grateful for days that are my own. Linda, really enjoyed getting to look into your life, inspirations and work. Thank you so much Sherry and Linda. I loved the post, and loved reading about Linda. I have loved her poems, and it is fun to find we have so much in common, being born so close together, I was born at the Methodist Hospital in Houston. Sherry thanks again for another fabulous interview. Linda I really enjoyed your story. I know AZ well as I ventured there to go to graduate school at ASU in the early 80s. My sister soon joined me as did my parents. My sister still lives in Tempe and my mom in Mesa. I visit once a year but never in summer. I moved back to the snow as the heat and insanely crowded highways did me in. But it is fabulous to visit and explore yearly. Looking forward to getting to know your poetry. Apologies for being so late to read and comment on this; been busy with offline activities the last few days. So glad I did read it now. Linda, I 'hear' such vibrancy and joy in your account of your life and activities; what an exciting and uplifting read! I love the paintings, the bird houses, and of course the writing. I think it's wonderful that there are way stations for Monarchs; glad you are one of them. And I'm glad you are sharing your work at Poets United. How my Father would have loved you, his favorite flower was the rose. Thank you for your comment. about my poem for dVerse..As a woman writer, I am much against form, since they are all created by men. Do you know of a form created by a woman? (If anyone might know, I think you might?) My poem was posted to open link on dVerse, you could write any form you liked. I wasn't trying to write a sonnet. I was writing about the arrest of Roger Stone. Thanks for coming by. I did not find your write? I did not know how to contact you.